Over the past couple of years, Xiaomi has been gathering a lot of momentum in its main target markets, India and China, and is expected to officially enter US grounds in around two years time. The company announced its new Mi 6 smartphone this April, offering Android fans quite an affordable, elegant and powerful handset to consider in the year ahead. The March-June period subsequently turned into Xiaomi’s most successful quarter ever, with 23.16 million shipped smartphones and brave forecasts for the whole year. 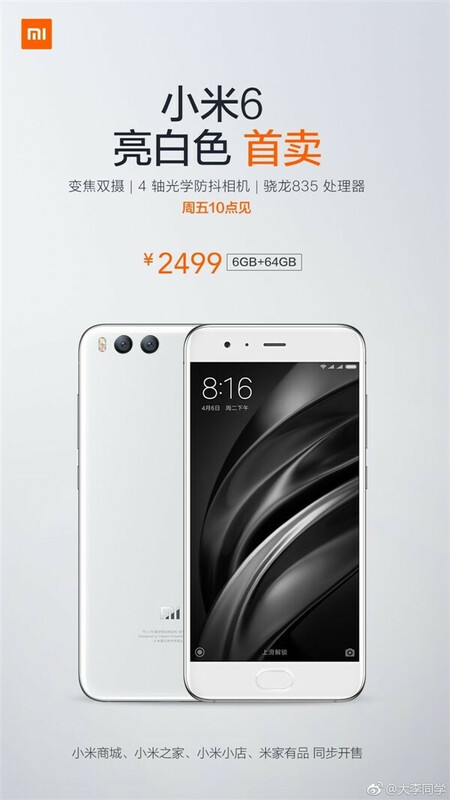 Upon unveil, the Chinese tech company announced that the latest Mi 6 will be available in black, white and blue, with two special silver and ceramic editions. However, in reality, up until recently, customers could only purchase the black and blue variants, with ceramic handsets quickly selling out of stock, and the silver one never making it to the shelves. Nonetheless, Xiaomi has confirmed that its white Mi 6 will become available today, offering yet another color option for the curved glass body. Apart from the new color, nothing is expected to change inside the device, and it will pack the specs the other color variants already offer. The Mi 6 benefits from Qualcomm’s Snapdragon 835 CPU, which is pretty much a standard for leading smartphones this year and powers devices in the likes of the Galaxy S8 phones, the OnePlus 5, and others. The white Mi 6, just like other color variants, comes with 6GB of RAM for both its 64GB and 128GB storage options available, with prices of $368 (2,499 Yuan) and $427 (2,899 Yuan) for each variant, respectively. iPhoneSamsungIhateXiaomiArena is just trolling so hard at the moment.